Headlines Fishing has been getting tougher in the lakes with the persistant hot weather. Fish are still being caught though you may have to work harder or smarter to catch them. 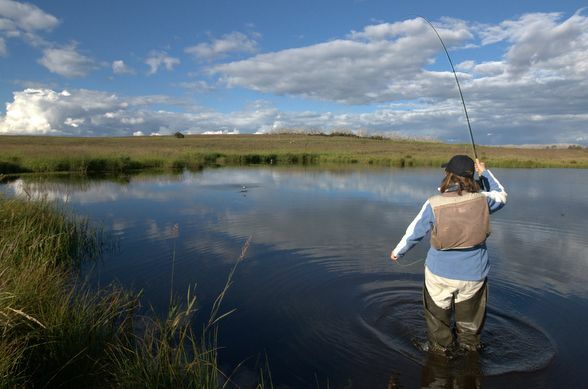 Rivers:- Are a great option with reasonable flows and plenty of terrestrial fishing available. Early and late will be best though a hopper pattern fished during the day may tempt a few fish. A bead head nymph under a dry would we a good rig in deeper pools if the hot weather continues. Some good fishing has been occurring in the Eucumbene, Thredbo and Murrumbidgee over the past two weeks and should be good for some time yet. Lake Eucumbene:- Has still been on the rise though the surface temps have been an issue. Anywhere from 21-24 degrees has been the norm and the fish have not been as active on the surface over the past week. There have still been fish taking adult dragonflies and caddis right on dark. Best bet would be to fish very early morning or fish sinking lines off deeper points and bays. * Stan Pyle and Paul Barker did well two weeks ago, landing in three sessions, 19, 14 and 25 fish on consecutive nights between them. Best fish were browns of 1.6 and 1.8kg. *Dino Taglieri and I fished last Thursday night for only three fish but we did see quite a few rising to caddis and jumping for dragonflies. Mudeyes patterns have worked after dark but the fish don't seem to be hanging around for very long in the lake margins. 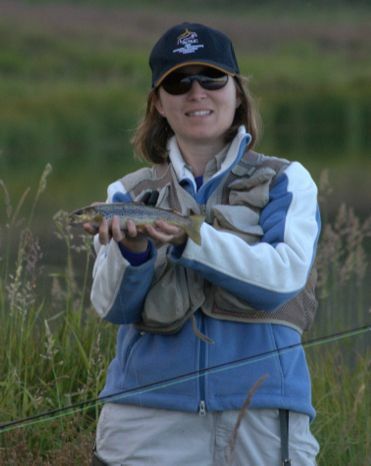 *Below, Mary-Therese Daniel hooks into a feisty brown on a high country dam. and displays a nice fish that ate a klinkhamer. Eucumbene:- Eucumbene trolling reports have been reasonable with most anglers being able to turn up a few fish. Downrigging has been the best method with tassies run down at 25-36ft doing well in the Pasture bay area. #89 and Y82 tassie has been a great colour off the rigger. Jindabyne:- Trolling has been good in Jindabyne with some super fat rainbows being taken off downriggers. As in Eucumbene early starts and or fishing very deep will be the most succesful. Reports have been that the fishing is tough overall in both the main lakes. Seven Gates, Dam wall and Middilingbank in Eucumbene and Creel bay and any deep points in Jindabyne should still fish o.k despite the heat.